When negotiating payor contracts, it is critical to do an independent data analysis of your clients' contracts to effectively increase reimbursements. This work should be done up front, prior to negotiating any contracts. Always rely on your billing system and your own data to determine your revenue. While payors also track revenues and can provide this information, it may not be consistent with your internal tracking data. You should be able to find the exact fee schedule that a payor is currently paying your clients. Payors have large underwriting and actuarial departments and they weigh the risk and payout of the services in your fee schedules. Plan on spending at least 50 percent of your time and effort up front, determining and analyzing predominant CPT codes – that is, the 20 percent of your codes that drive 80 percent or more of revenue. For many practices this will be around 20-40 CPT codes. By applying the three techniques in this article, you will put your clients' practices in a much stronger position to increase payor contracts' reimbursements and you will be able to level the playing field with the payors you negotiate with by putting a well-thought-out strategy in place for your clients' contract negotiations. Many practices work on a broad hypothesis and their own approaches for negotiating payor contracts' reimbursements. The problem in doing this, much like amateur stock picking, is that there are many land mines that can bite client practices, including unexpected revenue declines from newly negotiated agreements. 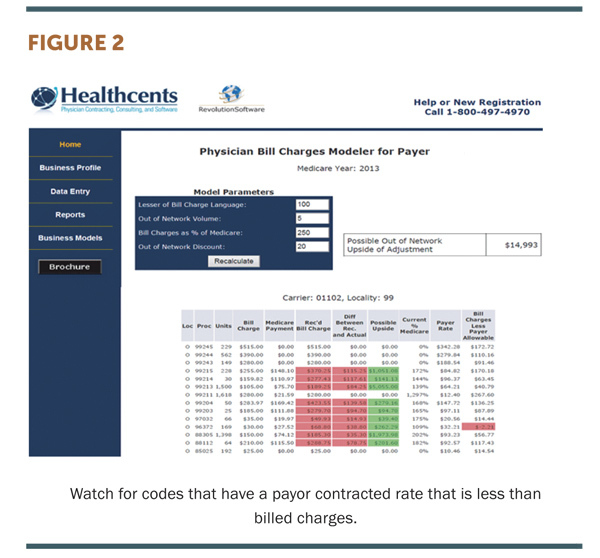 If you follow the advice and concepts behind the three areas examined in this article you will be very effective in assessing the impact of payor fee schedule changes and proposals to the practices, and you will also be very successful in using data and information to maximize contracts' reimbursements in payor contract negotiations. When you are assessing the percentage of local Medicare rates represented by a payor's fee schedule, in aggregate, it is important to normalize the calculation across your fee schedule to take into account the revenue produced by each CPT code – i.e., the volume performed times the payor rate at 100 percent, including patient co-payment and co-insurance vs. the Medicare revenue produced by that code at the same volume. Otherwise, you will calculate an average that is simply calculated by summing each percentage of Medicare by CPT code and dividing by the total. The problem with using averages, not weighted averages, when assessing a payor's fee schedule is that the average does not take into account the relative revenue importance of the code. That is, the average treats all codes equally whether they produce $1 of revenue or $250,000 of revenue. Many payors will present very impressive fee schedule changes that show your average reimbursement as a percentage of local Medicare rates increasing across a broad fee schedule. However, the codes that you care about most are the ones producing the highest revenue. All CPT codes are not created equally. Revenue contribution must be used as a differentiator. The example in Figure 1 illustrates the importance of using weighted averages. In this example, the average percentage of Medicare, in aggregate, for the two codes combined is 178.5 percent. This is what the payor will tell you and this, in fact, is accurate. The only problem is your "real" average reimbursement – the weighted average – is actually 137 percent. This is because when you average the reimbursement across these two codes, the 266 percent associated with code 77418 is weighted the same as the 91 percent associated with CPT office visit code 99213. What is not factored into the average calculation is the Medicare revenue and the actual revenue value of the code based on the payor contracted rate. In this case, the Medicare rate is higher than the payor rate for CPT code 99213, while the Medicare rate is much lower for CPT code 77418 than its payor rate. (See the formula and calculation in column H.) The fact is, the average places too much importance, in this case, on CPT code 77418. Since it has such a high payor rate relative to its Medicare rate, it generates a very high percentage of Medicare, 266 percent. As seen in Figure 1, the real rate when using a weighted average calculation is 137 percent of Medicare. If this were a real payor contract negotiation, we should be negotiating up from this 137 percent, not from 178.5 percent. Further, the payor may be averaging across all CPT codes in our fee schedule, not just the top revenue producing codes. The outcome, in cases like this, would be skewed against you. It is not that the payor is wrong for telling you that the average rate of reimbursement is 178.5 percent. Rather, it is wrong for you to base your negotiation on the average since the average does not account for the revenue impact of each code. It is best to use weighted averages to maximize your reimbursements. In the last 15 years, we have successfully negotiated over 10,000 payor contracts for all sizes and shapes of practices, ASCs, hospitals, ancillary providers, and medicine and supply/ DME manufacturers. One of the most common operational language clauses in payor contracts is referred to as the "lesser of billed charges" clause. While the language may vary slightly among agreements, the clause is usually worded like this: "[Health insurance company] will pay provider the lesser of its billed charges or its payor contracted rate for each CPT code's reimbursement." What does this mean exactly and why is it important? What this means is that, for example, if your payor contracted rate at 100 percent, including patient co-payment, is $110 for CPT code 99213, a routine outpatient 15-minute office visit code, but your billed charge is $90 for this code as defined in your charge master, you will be paid $90 per office visit rather than $110, your contracted rate! If this problem expands beyond just one CPT code, perhaps even pervades your entire charge master, then you could find that, while you have negotiated a terrific new contract, consistently, your claims are paid at much lower than your contracted rates. What can you do to protect yourself from this outcome across all of your payor agreements? First, it is highly recommended that you set your charge master at usual, customary, and reasonable (UCR) levels. In the absence of a specific accounting recommendation, a good starting point is about 250-300 percent of local Medicare rates. This approach will ensure that your CPT codes are above your payor contracted rates, unless you have CPT codes that pay above 250 percent of Medicare (you are one of the fortunate few, if you do). The point is to pick a high enough reasonable level of billed charges for all of your CPT codes. This approach has two benefits. First, it prevents your CPT codes' billed charges from being set below payor contracted rates. Second, you optimize your cash-based non-par business by ensuring that you don't leave money on the table (see Figure 2). In this example, in the far right column titled "Billed charges less payor allowables," there is one CPT code flagged in red, meaning this code has a payor contracted rate that is less than the billed charges and, as such, needs to be adjusted up by the negative dollar values specified in this column to avoid being reimbursed at the lower billed charge rate rather than the contracted rate. In this example, the contracted rate for code 96372 is $2.21 per service rendered higher than the billed charge rate. Imagine if this problem pervaded an entire fee schedule! It would mean that you have negotiated higher rates with the payor but are being underpaid because your charge master is set too low. This is why it is important to do this comparison for all of your top revenue-producing CPT codes. In this example, the middle columns identify codes, in red, that have billed charges set at less than 250 percent of Medicare. These codes need to be adjusted up by the amounts specified in the "Difference between Rec. and Actual" column to make sure that they are set at 250 percent of Medicare, the desired UCR level for each code. This demonstrates the importance of periodically auditing your charge master. Once every six months should be a reasonable timeframe to ensure that new codes or changes to Medicare and payor rates for existing codes will be discovered. Too often, practices set their charge masters and don't audit them for many years, if ever. 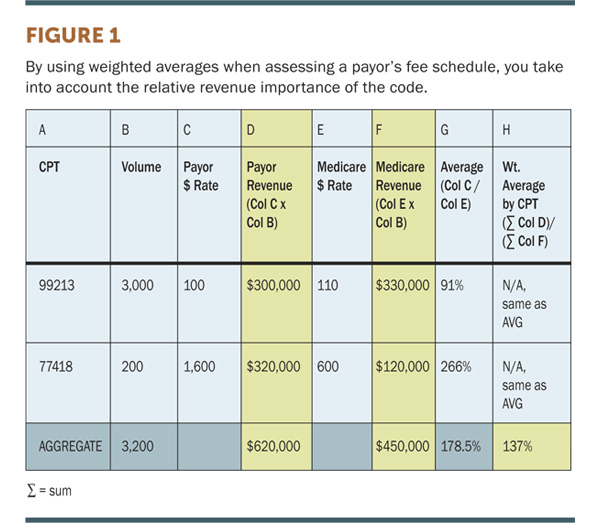 Since the "lesser of billed charges" language is present in almost all payor agreements, it is also imperative that you do a comparison, like Figure 2, for top codes for each of your payor contracts. This will ensure that you cross-reference your charges both to the payor rates of each payor and benchmark as a percentage of Medicare. Also, make sure to verify, with an accountant, that you balance write-offs correctly with the UCR threshold that you select for your charge master rates. In summary, an easy way to maximize revenue is to ensure that your charge master is set at UCR thresholds and that you periodically audit your charge master rates, by CPT code, and compare to your contracted rates by payor. Further, it is important that you have a consistent approach to setting your rates at a uniform percentage of Medicare, preferably 250 percent, or higher, to ensure that you don't get bitten by the "lesser of" language. How do we define "important" codes? These are your top revenue-producing CPT codes. There is often a tendency to try to gather and analyze data on payor-contracted rates for all codes or for the wrong codes. The problem with trying to gather data for all codes is that you likely will spend a lot of your staff and analysis time digging up data on 300-plus codes that have little effect on your revenue and dilute the focus on the top codes that are driving 80 or 90 percent of your revenue, which is usually about 15-40 codes. Further, if you try to analyze a total fee schedule of several hundred codes or more and you do not have volume data specific to every code, then you will fall into the landmine described above, using averages instead of weighted averages. This means that you will not know the real effect on your revenue based on the payor's fee schedule changes. Revenue, and, therefore, code importance, is a function of the product of payor rate times volume. You cannot work with payor rates and volumes in isolation. For example, if you have a lab code that is $0.50 and you administer it in an in-house lab 2,000 times, the "importance" of this code is $1,000 total. However, if you conducted 2,000 99213 office visits at $100, you would be making $200,000. Both codes have the same volume but very different revenue results due to the pricing. In short, begin your analysis by identifying your top revenue-producing codes and stop when you get to about 80-90 percent of your revenue. This is likely in the 15-40 code range. cted rates. When applicable, take into account the effect of bilateral and multiple procedure reimbursement rates on your revenue. You learned three secrets to success in payor contract negotiations. Remember to always work with weighted averages rather than average reimbursement by code. Fully analyze your charge master to ensure that you do not fall victim to the "lesser of" language and that your billed charges are set at high enough UCR thresholds, and be sure to work with your most important codes (those codes producing the most revenue). Susan Charkin MPH, is the founder and president of Healthcents and leads client strategy and new business development. Charkin's background includes more than 15 years of experience in senior contracting positions.